The headline in the business standard reads : "India must grow at 18% to ensure jobs to growing workforce: World Bank". The article is based on the recent world bank report titled "Jobless Growth" under the south Asia economic focus series. One would agree that 18% growth for a country of our size is not attainable. That being so, the headline implies that World Bank is saying that India cannot secure jobs to its growing workforce. Gloomy picture indeed. There is an element of certainty about the nice round number 18 which misleads a lay reader. It is not so if one reads the actual report. The actual report has pushed in enough caveats to survive any close scrutiny about the number 18. The problem is, the report presents things in a way that make newspapers pick up such headlines. That's a danger that any report writer should be wary about, and should factor in while presenting data to a lay reader. To expand the debate, the assumptions behind the models and the assumed simplifications should be made amply clear to the uninitiated audience lest they take the models on face value and start drawing conclusions for real world. The simplified models work, under set of circumstances and assumptions, to enlighten about some particular causal phenomenon under study. And it stops at that. A brief look at the calculation of the number 18 would throw some light. The first assumption the model makes is the roughly U shaped relation between employment rates and economic growth. It runs thus. Data indicates that employment and per capita income appear to exist in a U shaped relationship as shown above. When per capita income is low, the country has high employment as people start working young and remain employed due to sheer pressure of survival. If they drop out, they go hungry. As per capita income grows, children enroll in schools and stay there longer, old people may get pensions, women may not go to work, and the abject need to work for survival decreases. This leads to decrease in employment till a certain stage is reached where the per capita income increases enough to reverse the trend. This happens as people in countries with high per capita income have higher education, they are less likely to drop out of employment, including women who now have access to better daycare and health facilities and can afford to be in the labour force. Also, better healthcare and life indicators ensure that one remains in labour force longer with less drop outs. The first set of assumptions while deriving the 18% growth is that such a curve exists, and India exists at a point on the curve where it is downward sloping, that is, more prosperity would lead to less employment with people dropping out. One may recall the recent debate in the newspapers about the EPFO based employment data being used to prove the growth in employment numbers. Everyone took sides, but agreed on the point that we are far from getting reliable data on employment. So the report cleans up some sets of employment data that it has and goes ahead with whatever best it could manage. Where Et is the employment rate, Yt is the total output, Nt is the population, Beta is the approximate slope of the U shaped curve around Yt, and negative for countries like India as mentioned above. Delta captures the responsiveness of employment to economic growth and is expected to be positive for India. Alpha and Gamma are short and long term constants arising while linearising the equations respectively. Then quarterly changes in employment are correlated with quarterly GDP growth, the report mentions that Okun's law (which roughly states that employment increases in direct relation to GDP growth) doesn't hold for India. For each percentage point increase in GDP growth, India's growth seems to drop by 0.11%. Counterintuitive? Yes, but the models say so. And within south asia, the law holds in Pakistan and Sri Lanka and fails for India. Nevertheless, we plough ahead with acceptable p values. c) Catch-up or Ambitious - Growth needed to catch up in terms of employment levels and get pushed to the positive slope area of the U curve in a certain number of years. Based on this, the model predicts the growth rates, and puts them on a neat bar chart. Now one may see that India needs a growth rate of around 18% to catch up with a time horizon T of 20 years. This chart doesn't contain any disclaimer. If one simply scrolls down the report and stops at it, it misleads. While the methodology is probably the best one could get in given circumstances of shaky data and inapplicable models, yet the chart doesn't mention any of those. It assumes a linear and deep reading of the text. If you observe, by the time you reach here in this post, you must have forgotten the first U curve assumptions I started with, unless you are econ types. Most policymakers in India are not Econ types. They are generalists who are more managers than policymakers. And that's why I have problems with data presented in this form. It has a ring of conclusiveness to it while the report embed the doubts about the U curve and Okun's law inside the text. To be fair, the report has been candid about employment data inaccuracies. If asked, I would present the following way. I would add up the uncertainties at each level in the modeling process as error terms. And when the final value is presented, and if forced to make a bar graph, I would include this cascaded final error term in the projection. It would be a range to reflect the uncertainties built into the model. 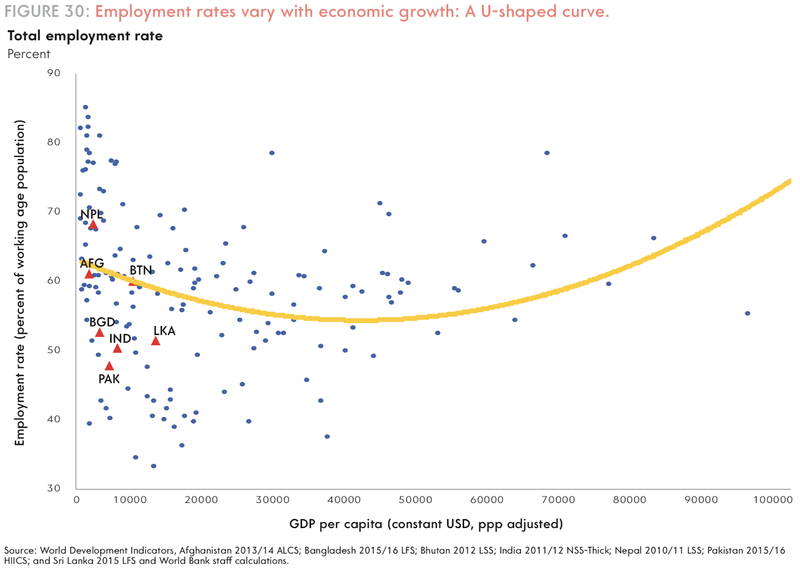 India might need around between 7 to 25% growth rate for twenty years to ensure jobs for a growing workforce, depending on where we lie at the downward sloping U curve, and depending on the assumption that it's an U curve after all, with an inverse relation Okun's law holding tightly enough; which though counterintuitive, we shall somehow ignore, and depending on how much we believe on the employment data being generated, and given that other things remain constant in the time horizon considered. This after ignoring the inherent assumptions in data collection methods, which ignores pakora makers, and uncertainties in calculation of GDP growth. We are in bad shape. Probably that'll not be a click-bait headline. But then, who cares about the misleading headline too? Distributed Ledger Technology (DLT), a concept of recording and sharing data across multiple data stores, or ledgers as they are popularly called, is an idea whose time has come. The concept of DLT was introduced through block chains in the famous paper by the elusive author known only as Satoshi Nakamoto in 2008. While the initial application was limited to crypto currencies, it didn’t take much time for the world to realise that the underlying technology of using distributed ledgers has multiple applications spanning various spheres. However, it is only lately that we are seeing actual implementation of the often discussed concepts. 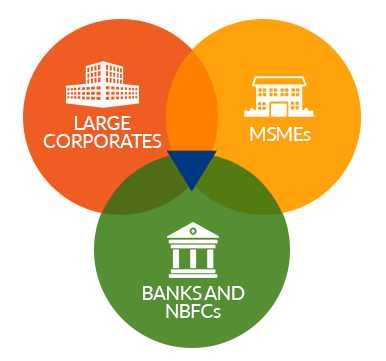 To cite an example of block chain application in mainstream commerce in India, we may look at the Trade Receivable Discounting System (TReDS) guidelines of the RBI, which sought to set up a system to ease the liquidity crunch for MSMEs by way of bill/invoice factoring in the financial market for the supplies made to big corporates. The simplified process under TReDS may be explained with an example. Let’s assume Mismi enterprise, which is an MSME, supplies items to Bigcor, a corporate house. Usually Bigcor takes three months to settle the payments after the delivery of goods. This holds up Mismi's working capital for three months leading to a liquidity crunch for Mismi. Mismi’s efforts to convince Bigcor to make payments earlier doesn’t work as Bigcor has market power to dictate terms to Mismi and other such suppliers. With the advent of TReDS, Mismi uploads the digitally signed invoice on one of the three platforms currently approved by the RBI. The upload is done after the supplies are made to Bigcor. Bigcor gets a time window (say of two days) to approve the invoice online, thus verifying the authenticity of the supply and the commitment that it would pay the sum against the invoice raised within three months (or the agreed time frame). The approved invoice can now be factored on the platform, through auction, by the financial intermediaries like banks/NBFCs. For example, BigBank may buy the invoice at a discount and pay the money to Mismi, thus providing it with immediate liquidity. The actual payment would be realised by the BigBank after three months from Bigcor. In an ideal competitive market place the discount should equal the interest cost for three months plus nominal service charges. Registration on TReDS has been made mandatory for public sector enterprises by the government. As the public sector is a big ticket buyer for a large number of MSMEs, it is expected that a critical mass would be easily obtained by the system to start rolling. Three platforms (RXIL, M1xchange and A.TReDS) approved by the RBI are already active. There are two clear advantages of using blockchain technology in such a situation. First, maintaining anonymity of invoice raiser is easier. Second, cross trading across multiple platforms is possible without the fear of double invoicing (double-spend problem). It makes the entire chain secure, anonymous, and verifiable at the same time. The credibility issue also gets sorted out. As TReDS is one of the early examples of implementation of Blockchain in real commerce, we can look at it as torch-bearer of a future era of trade facilitation. In fact, if the technology and infrastructure are set up correctly there is no reason as to why the entire paper based international trade transactions shouldn’t be moved onto something based on DLT. (b) Physical infrastructure for DLT including the system architecture and configurations. The first point can be integrated with the trade facilitation efforts in the next stage at the WTO. It could be augmented through efforts at making model laws and best practices at UNCITRAL/UNCTAD. The second part is where individual governments and private sector would have a greater role to play. We have proved with TReDS that we have the ability to push it. India could become a leader if we take the initiative at blockchaining the entire gamut of international trade transactions. It might indeed be a 21st century issue that India might like to discuss at the WTO. India has become world’s second largest mobile phone manufacturer in the world after china. While there are reasons to cheer, there is also a feeling that we are at the screwdriver level technology when it comes to electronics hardware manufacturing. We bring in most of the components and assemble them here using screwdrivers. The critiques use the term screwdriver technology to deride such activities. What many of them miss is the fact that usually such screwdriver technologies are the stepping-stones to upper levels of value chain. And while at it, the millions who turn the screwdrivers have a job. During early 2000s I used to work in the engineering product development at an Indian firm. We designed the components in house, did all validation tests, and launched the products in the market. My skills got me a well paying job with a US multi-national corporation that had newly set up an engineering service centre in India. I was one of the first dozen employees there. Once I joined, I was placed in front of a computer and asked to do something called ‘engineering change note’ (ECN) work the whole day. The drawings arrived from US, through secure online mode, necessary minor changes were carried out at the center, and then the drawings were uploaded for checking and approval by the US parent. I never saw the actual product. It was frustrating and after a couple of months I barged into my manager’s cube to vent. The manager, a US-returned Ford motors veteran, told me coolly, “Son, keep at the ECN for some months, then I will get you 2D to 3D conversion work.” That 2D to 3D conversion work was just a miniscule step above in value chain than what I was doing. It was frustrating. Recently, I visited the same facility after many years. The centre now employs more than a 1,000 engineers and carries out advanced engineering work including product conceptualisation and development. They have a full-fledged product-testing lab that carries out the product validations. The journey took less than 15 years for the centre. The ECN work was the screwdriver technology. The current work they do is cutting edge. There are thousands of such engineering centres in India today, falling somewhere along the spectrum that spans from ECNs to engineering system modelling. Most of them started with ECNs or 2D to 3D drawing conversions. The same story holds for IT services where we started out as Y2K bug operators, a screwdriver technology. When one spots a screwdriver, one should look at the direction it points to. Usually they point to the next level. The same holds for manufacturing, but for two differences. First, goods face tariffs at borders and tariffs play a role in determining the technology that is developed in the country, which I shall discuss below. Second, manufacturing of goods, especially consumer goods, electronics hardware and advanced engineering products, has moved to global value chains (GVCs) in recent decades due to discretisation and specialisation of production steps, and containerisation of cargo, which led to ease of transportation. The goods pass through tariff barriers whenever they cross borders. If the tariffs for parts as well as the finished item were to remain same, screwdriver plants would vanish, as completely assembled items would then be shipped in directly. Therefore, policymakers design tariffs in such a way that progressively higher value added products face steeper tariffs. This works in a tiered manner. The screwdriver assembly lines come up first. Then simple sub assembly lines would form. Then comes the component localisation. And finally we end up with the complete product being manufactured and assembled in the country. It might not always work the same way or in that order, but that’s the overall drift if things go as planned. The auto industry is a good example of how this worked. The sector was opened very gradually during the 90s. It still is one of the guarded industries, making US President rant against the high tariff walls on Harleys sent to India. But the calibrated move helped the sector. On the other hand, WTO’s Information Technology Agreement (ITA1) ensured that tariffs on electronic hardware items covered through the agreement were brought to zero, and this stunted the growth of electronics hardware manufacturing in India. It made more sense to pick up the electronic hardware from ‘factory Asia’ (China, Japan, ASEAN) and ship them to India. There is a counter point that lower priced electronics helped the information technology (IT) service sector grow. However, this counterpoint does not factor in the loss to hardware manufacturing and associated jobs that never materialised, or the fact that IT services mostly operate out of zones such as software technology parks of India/special economic zones (SEZs), where duties anyway are zero for all imports. Add to it the loss in technology development, and we can easily see why it was a bad idea. The argument here is not that we should have high tariff walls everywhere; but that the policymakers need to pick and choose the way the tariffs are structured for each sector in order to help manufacturing. There is no point in dropping all tariffs to zero in the name of free trade. It must however be noted that not all sectors are amenable to a mere structured tariff policy alone. For example, chip making or silicon wafer manufacturing technology operates at economies of scale and requires initial sunk research and development (R&D) costs, and this needs a massive initial push and support. Mere tiered tariffs will not convert the solar module makers of India, a simple assembly operation, into silicon ingot makers or wafer dicers even after decades. Further, handholding is required for that to happen. This is being done through efforts such as M-SIPS programme of MeitY, which is trying to boost electronics hardware manufacturing. Such dual effort of tariff structuring and handholding is required in multiple sectors to cajole the manufacturing into growth phase. Critics who lament every tariff hike or state led support as Nehruvian economics miss the point here. There is nothing wrong in thinking in that direction. It might appear to some as a return to licence-permit raj, but given the amount of efforts the government is putting towards automatic approvals and ease of doing business, it is wrong to compare this to the pre 90s era. The interfaces are fast moving online for all kinds of public citizen interfaces, right from customs clearances to industrial approvals. When China talks about ‘Made in China 2025’ and focuses on key sectors, they are actually talking about strategising such state support. It is a common developmental strategy. The second often talked about matter in recent years is about how global value chains (GVC) has changed the way manufacturing is carried out. This is visible especially in sectors such as automobiles and electronics. The ‘designed in California assembled in China’ iDevices model is an example of GVC in operation. China adds less than 10 per cent of value to a typical iPhone, which is actually a product of multiple countries with each contributing various components and inputs.Being a part of GVC is important in order to bring in jobs in these sectors. If zero custom tariffs implied automatic participation in GVC, India should have become tightly integrated with ‘factory Asia’ long ago. We had cheap labour, zero or low tariffs on most electronic components and SEZ facilities where custom duties are zero for imports. Therefore we should have automatically got integrated into the GVCs in a meaningful way. That didn’t happen to the extent we wanted. For sure, the trade in value add statistics for India makes us look good as long as we see the value added percentages alone. When we look at the quantum of trade, we are far below the expectations. Low tariffs is just one variable for GVC participation. In addition, we need infrastructure, skills, R&D investment, ease of doing business and supportive policies in order to gain the required competitiveness to be a significant GVC player. The government is moving in that direction. That brings us to the point that the time in our hands is very limited given the twin factors of advancement of automation in manufacturing and what we call as peak trade phenomenon. The automation would soon disrupt the labour cost advantage. We need to strategise keeping this in mind. Only upskilling and increased productivity would keep us in the run for future. The appetite for old world way of discretisation of manufacturing is on the wane. The stalemate at WTO, threats of tariff wars, and the rise of anti trade sentiments is a testimony that probably the best of opening up days are behind us. Developing a strong manufacturing sector is not an option but a necessity. We are in a different century, with unique challenges like automation, yet it would help us look at the experience of those who got the manufacturing right. A good example is China. They opened up with screwdriver level technology jobs, forced foreign companies to transfer technology through local partnerships, maintained cheap currency for decades, provided state subsidies and incentives, and used all tricks available in policymaker’s book to become a leader in manufacturing. South Korea followed neo-mercantilist trade policies up to early 80s to grow its exports machine. MITI played an important role in development of Japanese industry and exports. Had all these countries followed a universal low tariff theory during their stages of industrial infancy, they might probably not have ended up with the same results. Here, one must caution that such state actions at times might generate unintended consequences and hence cannot be a blanket recommendation. However, one cannot deny that these examples demonstrate that a determined state which runs a systematic industrial and trade policy plays an important role in growth of manufacturing and exports. India is waking up to a synchronised industrial and trade policy where the government is looking at playing a facilitator’s role. There is nothing wrong if a tariff is hiked here or there for valid reasons. Or if some rudimentary assembly plants pop up in the interim leading to doubts whether ‘Make in India’ has ended up with just ‘assemble and sell in India’. When I quit the private sector for a government career, I was working in area of system simulation of flight controls at Airbus, the biggest airplane maker in the world. That was as cutting edge as it got for me. The ECN job was a stepping-stone in my career. I am sure the screwdriver turning jobs of today would vanish sometime in a generation or two. We need to prepare for that future by moving up the value chain and preparing a solid manufacturing sector. The strategising and push must come from the state. I fail to see how it could be achieved otherwise. I have been a supporter of Blockchain technology (the keypin of crypto currencies) for long time now. I had blogged about the utility of secure open-ledger transactions here and here. Blockchain applications can be extended to virtually a lot of fields and international trade is one of them. India is at decent level of technology application when it comes to blockchains, as opposed to the shoddy levels we display when it comes to AI and machine learning applications in public policy sphere. To cite a good example of blockchain application in mainstream commerce, we can look at the Trade Receivable Discounting System (TReDS) guidelines of RBI, which sought to set up a system to ease the liquidity crunch for MSMEs by way of bill/invoice factoring in the financial market for the supplies made to big corporates. I shall briefly explain the simplified process under TReDS with an example (or see image below). Let's assume Mismi enterprise, which is an MSME, supplies items to Bigcor, a corporate house. Usually Bigcor takes three months to settle the payments after the delivery of goods. This holds up Mismi's working capital for three months leading to liquidity cruch for Mismi. Mismi's efforts to convicne Bigcor to make earlier payments doesn't work as Bigcor has market power to dictate terms to Mismi and other such suppliers. With the advent of TReDS, Mismi uploads the digitally signed invoice on one of the three platforms currently approved by RBI. The upload is done after the supplies are made to Bigcor. Bigcor gets a time window (say of 2 days) to approve the invoice online, thus verifying the authenticity of the supply and the commitment that it would pay the sum against the invoice raised within three month (or agreed time frame). The approved invoice can now be factored on the platform, through auction, by the financial intermediaries like Banks/NBFCs. For example, BigBank may buy the inovice at a discount and pay the money to Mismi, thus ending the liquidity crunch immediately. The actual payment would be realized by the BigBank after three months from Bigcor. In an ideal competitive marketplace the discount should equal the interest cost for three months + nominal service charges. Registration on TReDS has been made mandatory for the public sector enterprises by the government. As public sector is a big ticket buyer for a large number of MSMEs, it is expected that a critical mass would be easily obtained by the system to start rolling. The three platforms are already active. They are RXIL, M1xchange and A.TReDS. When the system was initially set up, there were apprehensions that the big corporate bodies were uncomfortable with the identities of their suppliers being revealed online. Now the platforms have come up with the solution that includes the blockchain. I see two clear advantages of using blockchain technology in such a situation. First, maintaining anonymity of invoice raiser is possible. Second, cross trading across multiple platforms is possible without the fear of double invoicing. It makes the entire chain secure, anonymous, and verifiable at the same time, in a way the simple digital key encryption cannot. As TReDS is one of the early examples of implementation of Blockchain in real commerce, I see this as heralding an era of trade facilitation through e contracts, secure e waybills, secure letters of credit, bills of lading, international factoring and forfaiting services and so on. In fact, I don’t see a reason as to why the entire paper based international trade transactions including title of goods (currently the paper bill of lading) shouldn’t be moved onto something based on blockchains which are maintained through peer to peer open ledger platforms. B) Infrastructure support to develop and maintain the basic structure of the transactions or the marketplaces - either through private parties or through a multinational consortium. While A can be integrated with the trade facilitation efforts in the next stage at WTO, and through efforts at making model laws and best practices at UNCITRAL/UNCTAD, part B has to be a joint or multilateral effort by the leaders in the field. Both are doable. The technology is there. We need to gather the will to push it. Probably India might be a leader if we take the initiative. It can indeed be a 21st century issue that India might like to discuss.